Hello friends! Happy August: the last warm month of the year where we try to cram in everything we thought we’d do over the summer but haven’t yet accomplished. 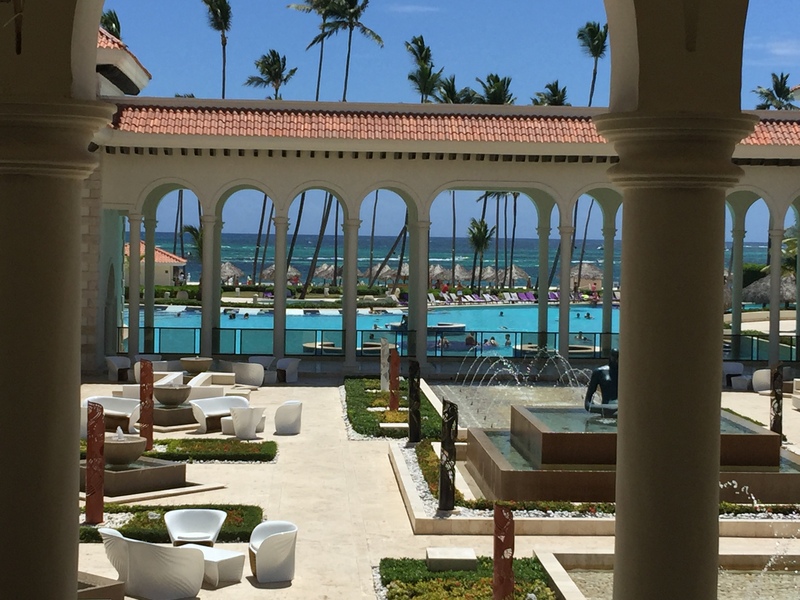 Last week we returned from Punta Cana, Dominican Republic, our first time there. We stayed at the lovely Paradisus Palma Real Golf Resort & Spa and it was wonderful. The weather was perfect. And the people were warm and friendly. Our hostess upon arrival, Reyna, gave us a tour of the hotel grounds on the way to our room. She called my husband Papa and I was affectionately referred to as Mama. This is the view from the reception desk. Paradise, right? 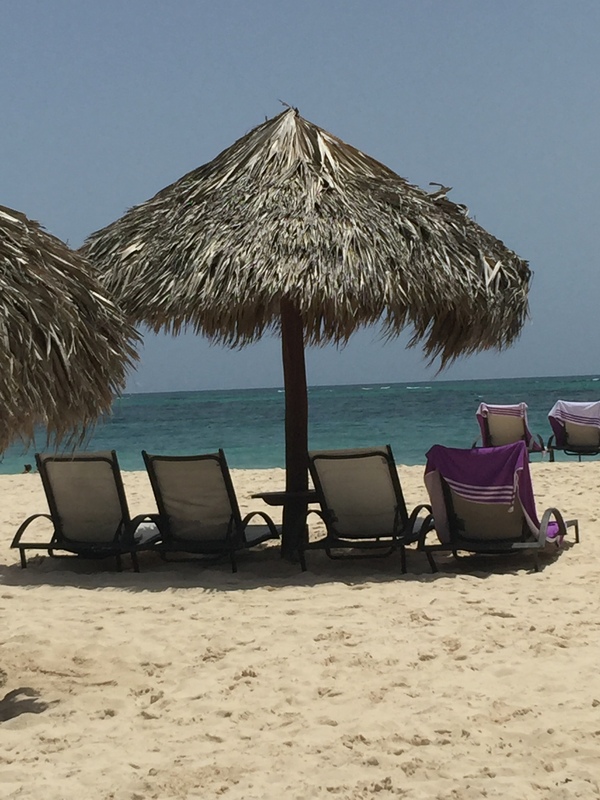 This resort is an all-inclusive resort, meaning food and drinks are prepaid. I have two teenage boys over six feet tall. This was the only way to go. 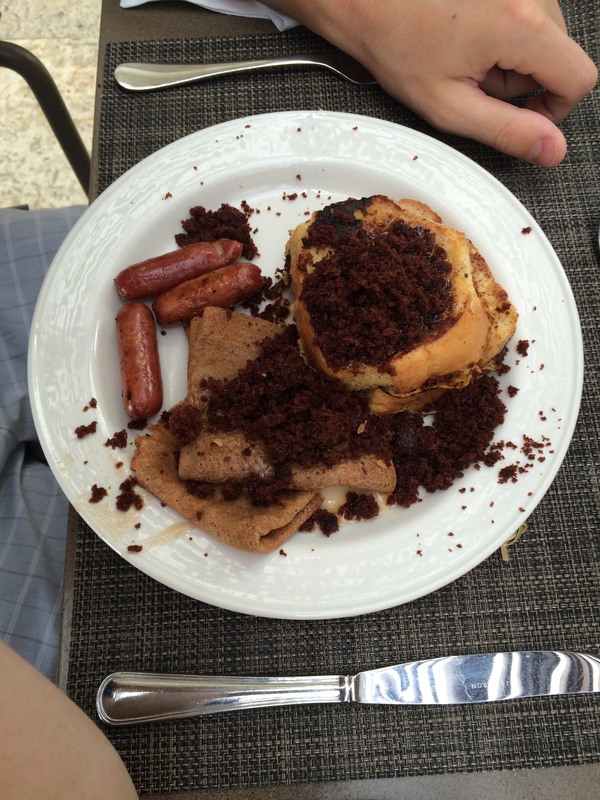 Here is one of the plates of my 17 yo’s breakfast. It rivaled Buddy’s from Elf. Yes, that is crumbled chocolate cake over french toast and chocolate crepes covered in syrup. With sausage links. This was his first plate. We found seats on the beach every day under thatched cabanas, where we watched the pale green water lap onto the shore beneath a deep blue sky. Parasails flew in the gentle wind above hobycats and kayaks. My toes sunk into the silky white sand and I spent hours each day soaking up the atmosphere. I don’t spend enough time outside when I’m home. I made up for that here. Each time Reyna passed by the pool or outside deck, giving another tour to new arrivals, I heard “Mama!” over the music and swimmers’ laughter. Each time I waved to my new friend and she continued on. 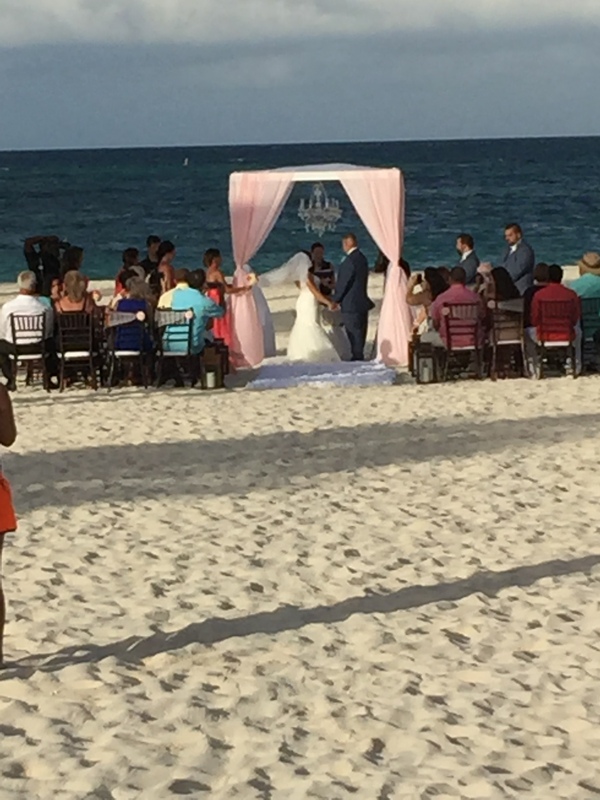 In the early evenings, we drank pina coladas on the large deck and got teary over weddings on the sand. (Okay, I got teary, the rest of us, not so much). After dinner, we walked among the arches of the hotel buildings and watched salsa dancing under the stars. 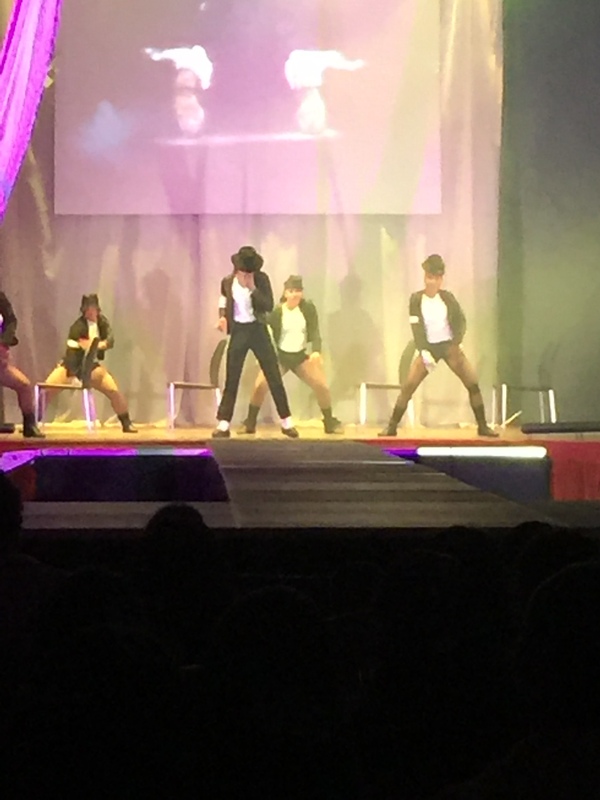 The Dominican people love to dance. Look at this place. If you were here every day, wouldn’t you? There were shows every night, spin and yoga classes in the pool during the day. Our last dinner was served on the beach, authentic food of the Dominican people, while bands played and entertainers performed. Sure there were some small issues. Being in a foreign country, we had to remember to brush our teeth with bottled water. Our 15 yo was struck down for a full day with stomach issues but fortunately he quickly bounced back, returning to his gluttonous behavior at the buffets. We lost power a few times- usually while I was mid-shower, possibly due to the quick rainstorms that passed over almost every day, but they came back on within minutes. This is to be expected everywhere. Little kinks to work out. Overall, we couldn’t ask for more. It was a lovely break from the reality of work and responsibility. We’ve been back a week and I long for one more day of music, white sand, a drink with an umbrella and a sweet voice calling Mama. Where have you been this year? 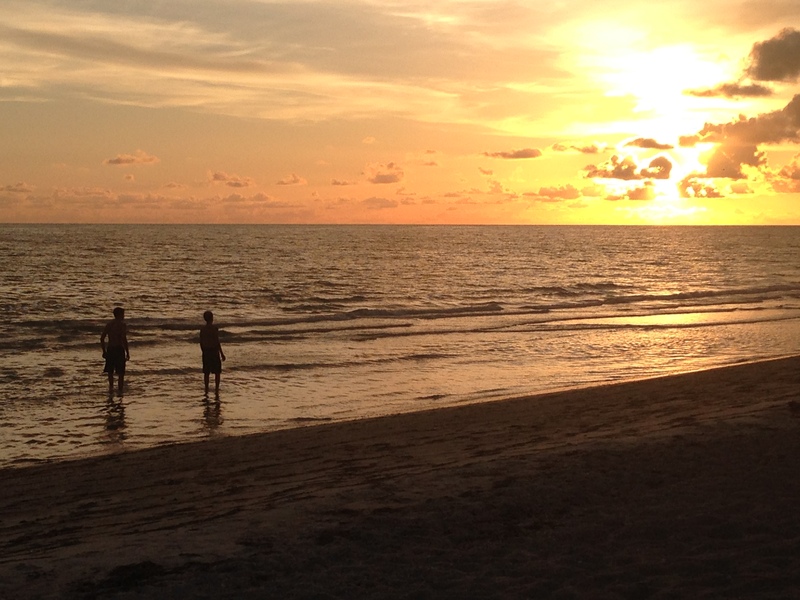 We recently returned from a family vacation to our usual spot on Longboat Key, Fl. – something we look forward to all year while working, shoveling snow, studying for tests and sweating through sports practices and tournaments. Two weeks of uninterrupted sun, sand and surf. Nirvana. Okay, maybe it’s not quite Nirvana. Longboat Key, a barrier island community located on Florida’s west coast, in the county of Sarasota, is idyllic for couples who need a quiet break from reality, old people who can no longer deal with the harsh Northeast weather, and teenage girls who want to work on their tans all day and shop at night. The brochure says nothing about teenage boys. Our first day at the near-empty pool, which happens to be six feet from the white sand and aqua Gulf, while the boys were doing what boys do, basically manhandling each other – for fun, I’m told – my husband and I exchanged a look. This may be a long trip. There were few, if any, other kids/teens or activities around to occupy their time. What pray-tell, will we do? 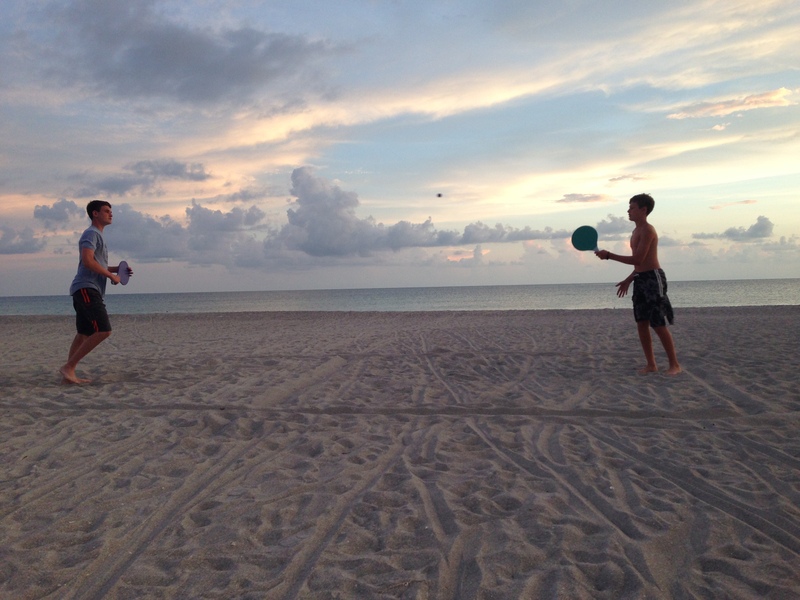 In between wrestling matches, we managed to fill our days with ProKadema on the beach, frolics in the Gulf, Marco Polo in the pool, push-up poker in the room and dinners out every night, followed occasionally by a mini-golf game and incredible sunsets. We were entertained by the delight our children took in ordering their meals at restaurants. Their favorite thing to do? Eat something Mom didn’t cook. Each night, we left our phones home and enjoyed conversations over meals, learning a bit more about these boys who are too quickly becoming men. They have bucket lists, goals and dreams. They are funny and thoughtful and silly. We rehashed each day and talked about their favorite subject – namely, where we would eat the following night and which ice cream store we would try next. Feeding a six-foot-one, fifteen-year-old is expensive. He is never full. For the rest of the year, I cannot complain about not having enough family time. We spent much of our waking hours, when not at the beach, in one 20×20 room, watching the World Cup, playing cards, reading and generally lying around. Our parental guidance-ometer took a nosedive (twice) when we let our pre-teen see R-rated movies, so the rest of us wouldn’t have to suffer through another Disney’s Pixar flick. Any more time down here and we would have given him his first beer. A week into our stay, we rented jet ski’s from a local marina and spent the afternoon on the Intercoastal waterway, jetting around the warm, clear water. At one point we stopped to take in the natural play of baby dolphins jumping through the air, their smooth, grey skin glistening in the sun, as I envied their graceful, peaceful existence in one of the most beautiful places on Earth. We were spellbound. I thought that would be the highlight of our trip. Certainly it was exciting and something that cannot be experienced in NY on the cold Atlantic. 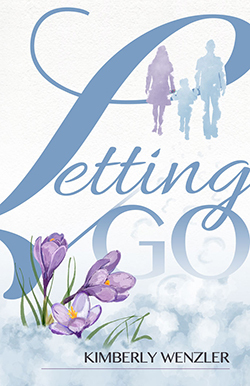 But upon reflection, the highlights for me were those quiet moments we take for granted, the easy smile across the table, the shared laugh or when one of my sons sidled up to me on the couch, rested his head on my shoulder, and said nothing, while I read. I’d glanced over my book to see that his thick chubby legs, with dimpled knees, have grown into long, muscular, hairy limbs that would take him, not too far into the future, into a life where I wouldn’t be with him every day. I know I can’t hold onto these moments, as much as I try, but they are ones to treasure. Sure, two weeks seems like a long time. When you think about it, fifty of the remaining weeks of the year fly by without mercy. We spend our days with work-mates, schoolmates, teammates and the neighborhood gang, and sometimes we lose touch with the nucleus we worked so hard to build, the one my husband and I promised to nurture and protect. So, if I have to sit around with nothing to do with my three favorite people in the world, for fourteen days, I say, bring it on. My family and I went skiing over Christmas break with our friends. Every year, usually last minute, we frantically make plans to get to a mountain after the holiday: spend days searching for a place large enough to accommodate 10-12+ rowdy boys (yes, only boys) and 8+ adults, send an exhaustive amount of group texts coordinating food, snacks, and drinks, and confirm times and routes to be taken. 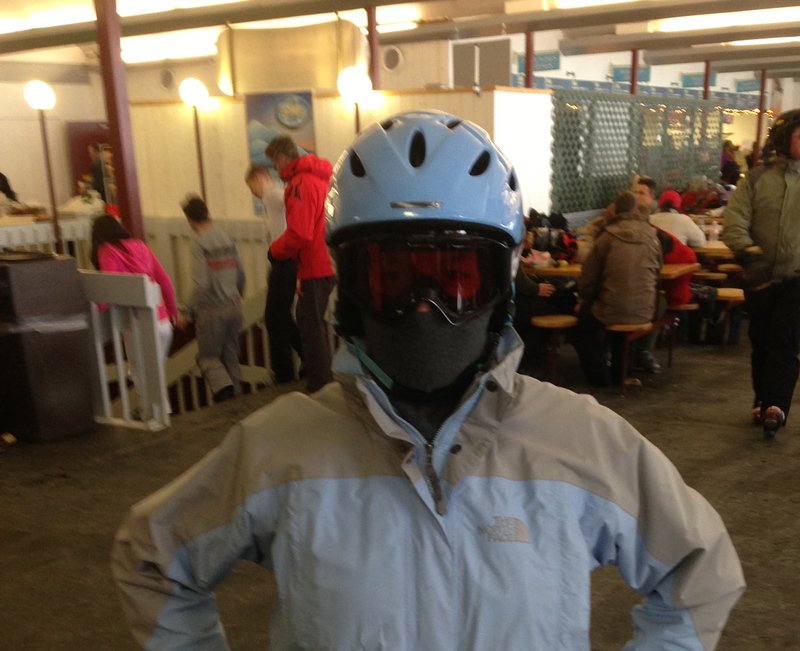 Then we spend two days prior to leaving, having the boys try on their ski gear: snowpants, jackets, helmets, boots, and gloves, and because boys grow at an alarming rate, we inexplicably find ourselves at a ski store replacing all ill-fitting items. The four hour drive is largely spent group-texting as to where we are on the road, who’s stopping for food, who hit traffic, got a ticket, made good time, weather info, snow, rain, sleet, status of exits passed…you get the idea. When we arrive, usually within minutes of each other, the group spends the next hour unpacking the cars. If it’s too late to squeeze in a half day of skiing, the cocktails and food come out and the rest of the night is spent catching up, while the boys do what they do, which usually involves some sort of wrestling match followed by parallel play on iPads and iPods. This year, we went to Gore Mountain, near Lake George, NY. It would be my first time back here in thirty years. We stood at the top. The two of us, together. And then, there she went, down the trail, carving perfect “S” turns, leaving a plume of powder in her wake, with me, in all of my mis-matched, borrowed clothes and ski’s, frozen in place, shitting my pants. Clutching poles as foreign to me as if they were attached to someone else’s limbs, I looked down the run, then back to the lift, seriously considering my options. I knew I couldn’t get back on a chairlift on my own, and well, I had gravity on my side. So, I timidly pushed myself off the crest and…I’m falling. I eventually made my way down, thanks to the assistance of one kind soul, who spent the good part of her morning retrieving my ski’s and poles for me every few feet. At the bottom, bruised but still in one piece, I took off my ski’s, returned them, and managed to avoid the sport for another decade, when I fell in love and put my trust in my boyfriend (now husband), who took the time and energy to teach me (and sign me up for lessons). He wanted me to learn, he said, because skiing is something we’d be able to do with our children one day. It’s a family sport, and one that they’d never outgrow. Year after year, we went, and with this in mind, I pushed myself, and tried to enjoy it. When our sons were old enough, we brought them to a family-friendly mountain in Mass, and put them in ski school. Two years later, they decided to snowboard. Back to square one. They were young. It took four years of lessons, of dressing tiny bodies in ten pounds of clothing, getting them to the mountain by 9am, on cold mornings, before they could manage the slopes on their own with confidence. This year, it rained the night we arrived. By morning, the temperature drops to a balmy 15, so when we get to the mountain, the air is frigid, the runs are icy, and the sun is MIA. We dress in layer upon layer, before donning our helmets, gloves, hand and foot warmers, neck wraps and face masks, pay hundreds of dollars for tickets, and trek to the bottom lift. One of the adults (I’m not sure who, but I suspect we were all thinking it) questions why we aren’t in Puerto Rico. “All you need is a towel and a bathing suit.” It seems like a lot of work, preparing for this. The conditions change daily, and the amount of clothing required for this sport always seems daunting. We take the gondola up (total perk here!) and during the ride through the cloudy air, we resemble a band of sci-fi burglars, all wrapped up, peering at each other through goggles and masks, trying to breathe. I imagine little thought- bubbles over us saying: Bathing suits. Towels. Sun. Luke, I am your father. We disembark at the top, grab our skis and boards, strap in and buckle up. Now, the sun decides to say hello. This is when it gets good. I take in our surroundings. There is nothing more beautiful than snow-capped pine trees under a blue sky, the quiet interrupted only by the swoosh of snow under ski’s, and most importantly, the pink cheeks and crinkled eyes of my smiling boys, in all of their glee, doing what they absolutely love to do; something they enjoy doing with me and my husband. I watch our sons effortlessly glide down the mountain, marvel at their skill and poise and feel so good that they’ll never be that kid in high school who goes on a ski trip, scared and inexperienced. I’ll just have to make sure they don’t put their inexperienced friends through the same hazing ritual I went through. Before they get too far ahead – they’re already more adept than I am – I push myself off the crest and… I’m flying.